35 U.S.C. 134 Appeal to the Patent Trial and Appeal Board. (a) PATENT APPLICANT.— An applicant for a patent, any of whose claims has been twice rejected, may appeal from the decision of the primary examiner to the Patent Trial and Appeal Board, having once paid the fee for such appeal. (b) PATENT OWNER.— A patent owner in a reexamination may appeal from the final rejection of any claim by the primary examiner to the Patent Trial and Appeal Board, having once paid the fee for such appeal. (A) On filing an appeal from the examiner to the Patent Trial and Appeal Board, $540. (B) In addition, on filing a brief in support of the appeal, $540, and on requesting an oral hearing in the appeal before the Patent Trial and Appeal Board, $1,080. An additional fee for forwarding an appeal to the Board after Examiner's Answer is set at 37 CFR 41.20(b)(4). 37 C.F.R. 41.31 Appeal to Board. (a) Who may appeal and how to file an appeal An appeal is taken to the Board by filing a notice of appeal. (1) Every applicant, any of whose claims has been twice rejected, may appeal from the decision of the examiner to the Board by filing a notice of appeal accompanied by the fee set forth in § 41.20(b)(1) within the time period provided under § 1.134 of this title for reply. (2) Every owner of a patent under ex parte reexamination filed under § 1.510 of this title before November 29, 1999, any of whose claims has been twice rejected, may appeal from the decision of the examiner to the Board by filing a notice of appeal accompanied by the fee set forth in § 41.20(b)(1) within the time period provided under §1.134 of this title for reply. (3) Every owner of a patent under ex parte reexamination filed under § 1.510 of this title on or after November 29, 1999, any of whose claims has been finally (§ 1.113 of this title) rejected, may appeal from the decision of the examiner to the Board by filing a notice of appeal accompanied by the fee set forth in § 41.20(b)(1) within the time period provided under § 1.134 of this title for reply. (b) The signature requirements of §§1.33 and 11.18(a) of this title do not apply to a notice of appeal filed under this section. (c) An appeal, when taken, is presumed to be taken from the rejection of all claims under rejection unless cancelled by an amendment filed by the applicant and entered by the Office. Questions relating to matters not affecting the merits of the invention may be required to be settled before an appeal can be considered. (d) The time periods set forth in paragraphs (a)(1) through (a)(3) of this section are extendable under the provisions of § 1.136 of this title for patent applications and § 1.550(c) of this title for ex parte reexamination proceedings. Public Law 112-29, sec. 10 authorizes the Director to set or adjust fees "established, authorized, or charged under title 35." The fees for appeal as set forth in 35 U.S.C. 41(a)(6) have been adjusted by rule at 37 CFR 41.20(b). See 37 CFR 41.20(b)(1) for the fee for the filing of a notice of appeal, 37 CFR 41.20(b)(2)(i) for filing an appeal brief in an application or ex parte reexamination proceeding, and 37 CFR 41.20(b)(3) for a request for oral hearing. Effective March 19, 2013, the fee for filing an appeal brief in an application or ex parte reexamination (37 CFR 41.20(b)(2)(i) ) was reduced to $0, and a new fee for forwarding an appeal in an application or ex parte reexamination proceeding to the Board after the mailing of an examiner's answer was added at 37 CFR 41.20(b)(4). See 37 CFR 41.45 and MPEP § 1208.01 for additional information pertaining to the forwarding fee. Under 37 CFR 41.31(a)(1), an applicant for a patent dissatisfied with the primary examiner’s decision in the second or subsequent rejection of the applicant's claims may appeal to the Board for review of the examiner’s rejection by filing a notice of appeal and the required fee set forth in 37 CFR 41.20(b)(1) within the time period provided under 37 CFR 1.134 and 1.136. A notice of appeal may be filed after any of the claims has been twice rejected, regardless of whether the claim(s) has/have been finally rejected. The limitation of "twice rejected" does not have to be related to a particular application. See Ex Parte Lemoine, 46 USPQ2d 1420, 1423 (Bd. Pat. App. & Inter. 1994) ( "so long as the applicant has twice been denied a patent, an appeal may be filed" ). For example, if any claim was rejected in a parent application, and the claim is again rejected in a continuing application, then applicant can choose to file an appeal in the continuing application, even if the claim was rejected only once in the continuing application. Applicant cannot file an appeal in a continuing application, or after filing a request for continued examination (RCE) under 37 CFR 1.114, until the application is under a rejection. Accordingly, applicant cannot file a notice of appeal with an RCE, even if the application has been twice rejected prior to the filing of the RCE. If appellant files an amendment, a notice of appeal and an appeal brief on the same date after the mailing of a final action, 37 CFR 1.116 applies. Such an amendment filed after a final action is not entered as a matter of right. It may be admitted if it cancels claims or complies with all requirements of form expressly set forth in previous Office actions; presents rejected claims in better form for consideration on appeal; or amends the specification, including claims, upon a showing of good and sufficient reasons why the amendment is necessary and was not earlier presented. 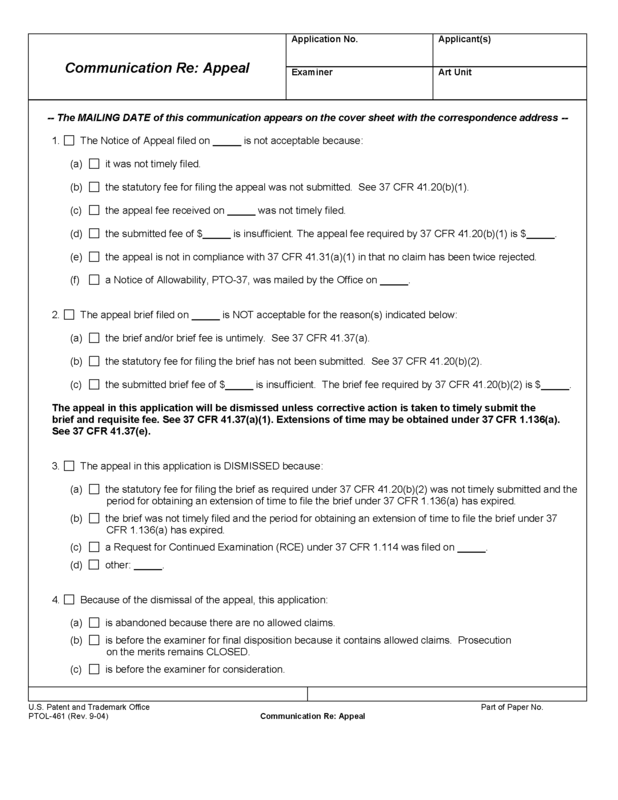 If applicant files a reply under 37 CFR 1.111 in response to a second or subsequent non-final rejection and later files a notice of appeal before the Office considers the reply, or the reply is filed on the same day as the notice of appeal, the notice of appeal is defective and the Office will answer the reply under 37 CFR 1.111 in due course. Ordinarily, a notice of appeal would have been proper when at least one claim has been twice rejected. In this instance, however, since applicant has elected to request reconsideration of the rejection (or further examination) by filing a reply under 37 CFR 1.111 rather than directly appealing from the second non-final rejection, the notice of appeal is premature. The Office has not had the opportunity to consider the reply under 37 CFR 1.111 and issue an Office action in view of the reply. (Note that this is different than after-final situations where a reply under 37 CFR 1.116 is not entered as matter of right and applicant is appealing from the final rejection). Applicant must wait to file any appeal until the examiner considers the reply and the claims are rejected again. Once the Office action is mailed in response to the reply applicant may file another notice of appeal under 37 CFR 41.31. Under 37 CFR 41.31(c), an applicant is presumed to be appealing all claims under rejection in a particular application unless cancelled by an amendment filed by the applicant and entered by the Office. Thus, an appeal is presumed to be taken from the rejection of all pending claims under rejection in the application regardless of whether the notice of appeal identifies fewer or more than all pending claims under rejection. If an appellant does not file an amendment cancelling claims that the appellant does not wish to appeal, but then also fails to provide any argument in the appeal brief directed to those claims, any challenge to that ground of rejection has been waived, and the Board has discretion to simply affirm any rejections against such claims. See e.g. Hyatt v. Dudas, 551 F.3d 1307, 1314, 89 USPQ2d 1465, 1470, (Fed. Cir. 2008). See also MPEP § 1205.02. Although the rules do not require that the notice of appeal be signed, applicants may file notices of appeal which are signed. 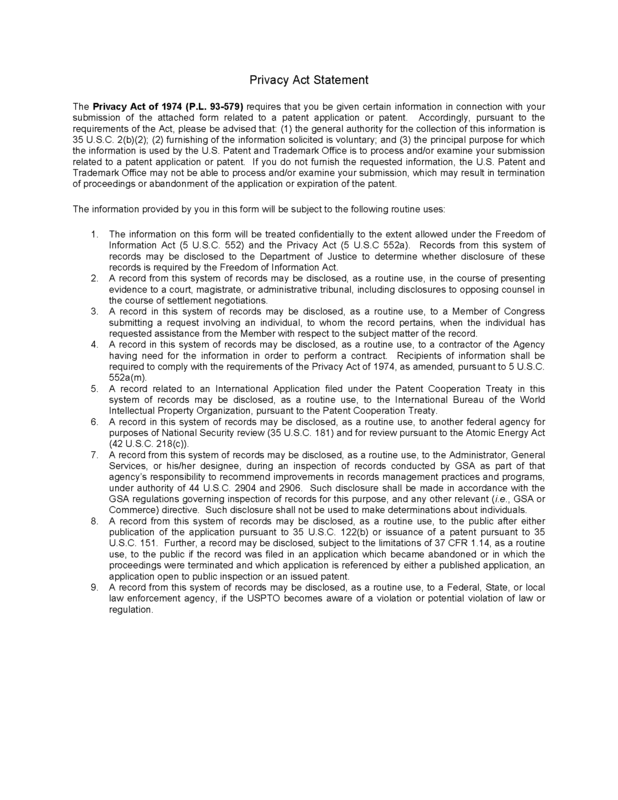 It should be noted that the elimination of the requirement to sign a notice of appeal does not affect the requirements for other papers (such as an amendment under 37 CFR 1.116 ) submitted with the notice, or for other actions contained within the notice, e.g., an authorization to charge fees to a deposit account or to a credit card, to be signed. See MPEP § 509. Thus, failure to sign the notice of appeal may have unintended adverse consequences; for example, if an unsigned notice of appeal contains an (unsigned) authorization to charge the notice of appeal fee to a deposit account, the notice of appeal will be unacceptable because the notice of appeal fee is lacking. The notice of appeal must be filed within the period for reply set in the last Office action, which is normally three months for applications. See MPEP § 714.13. For example, failure to remove all grounds of rejection and otherwise place an application in condition for allowance or to file an appeal after final rejection will result in the application becoming abandoned, even if one or more claims have been allowed. 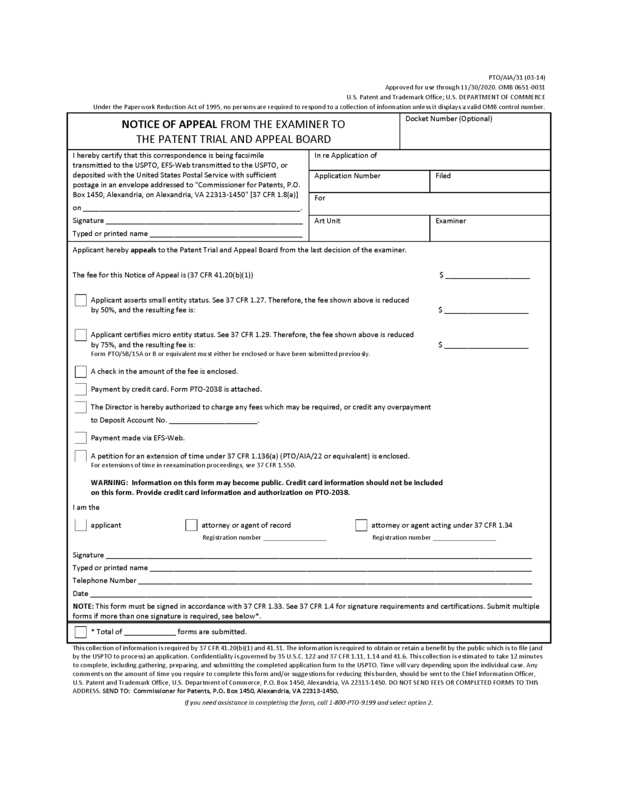 The notice of appeal and appropriate fee may be filed up to six months from the date of the Office action (e.g., a final rejection) from which the appeal was taken, so long as an appropriate petition and fee for an extension of time under 37 CFR 1.136(a) is filed either prior to or with the notice of appeal. The use of a separate letter containing the notice of appeal is strongly recommended. Form PTO/SB/31 may be used for filing a notice of appeal. Appellant must file an appeal brief in compliance with 37 CFR 41.37 accompanied by the fee set forth in 37 CFR 41.20(b)(2) within two months from the date of filing the notice of appeal. See MPEP § 1205. Effective March 19, 2013, the fee for filing an appeal brief in an application or ex parte reexamination was set at $0. For as long as this fee remains at $0, appeal briefs will not be held defective for failure to pay this fee or make any statement about this fee. 37 CFR 41.31(a)(2) and (a)(3) provide for appeal to the Board by the patent owner from any decision in an ex parte reexamination proceeding adverse to patentability, in accordance with 35 U.S.C. 306 and 35 U.S.C. 134. See also MPEP § 2273. In anex parte reexamination filed before November 29, 1999, the patent owner may appeal to the Board after the second rejection of the claims. In an ex parte reexamination filed on or after November 29, 1999, the patent owner may appeal to the Board only after the final rejection of one or more claims in the particular reexamination proceeding for which appeal is sought. The fee for filing the notice of appeal by a patent owner is set forth in 37 CFR 41.20(b)(1), and the time period to pay the fee is determined as provided in 37 CFR 1.134 and 37 CFR 1.550(c). Failure to file an appeal in an ex parte reexamination proceeding will result in issuance of the reexamination certificate under 37 CFR 1.570. Appeals to the Board in inter partes reexamination proceedings filed under 35 U.S.C. 311 are governed by 37 CFR 41.60 through 41.81. 37 CFR 41.30 through 41.54 are not applicable to appeals in inter partes reexamination proceedings. See MPEP § 2674 to § 26.3 for appeals in inter partes reexamination proceedings. The use of a separate letter containing the notice of appeal is strongly recommended. Form PTO/SB/31 or Form PTO/AIA/31 may be used for filing a notice of appeal. Appellant may check the status of the application and the receipt date of the notice of appeal on the Office’s Patent Application Information Retrieval (PAIR) system via the Internet. Where the notice of appeal is filed by mail, the Office does not acknowledge receipt by separate letter. However, if a self-addressed postcard is included with the notice of appeal, it will be date stamped and mailed. See MPEP § 503, subsection III. Notices of appeal are reviewed by the Patent Appeal Center. If a notice of appeal is defective, the Office will notify the applicant of the non-compliance. A notice of appeal is not a proper reply to the last Office action if none of applicant's claims have been twice rejected. A notice of appeal is defective if it was not timely filed within the time period set forth in the last Office action, or the notice of appeal fee set forth in 37 CFR 41.20(b)(1) was not timely filed. Form PTOL-461 (Rev. 9-04 or later), Communication Re: Appeal, should be used to indicate defects in a notice of appeal. This communication is done by the Patent Appeal Center rather than by the examiner. In the rare event that these defects are identified after the notice of appeal is entered, the examiner should contact the Patent Appeal Center to determine the appropriate action to take. When appellant files an appeal brief without first filing a notice of appeal, the Office treats the appeal brief as a notice of appeal and an appeal brief. For this situation, appellant must file the brief within the time period for reply set forth in the last Office action and the brief must be accompanied by the fees under 37 CFR 41.20(b)(1) and (b)(2) for filing a notice of appeal and an appeal brief in compliance with 37 CFR 41.31 and 41.37. Effective March 19, 2013, the fee for filing an appeal brief in an application or ex parte reexamination was set at $0. For as long as this fee remains at $0, appeal briefs will not be held defective for failure to pay this fee or make any statement about this fee.